As of 2018, the 17 Sustainable Development Goals (SDGs) and climate actions embedded in Nationally Determined Contributions (NDCs) to the Paris Agreement are still largely implemented under separate tracks. Policymakers report significant challenges in connecting two processes that have their own histories, communities of actors and political dynamics. Yet a siloed approach makes little sense given the short window of opportunity for tackling the interlinked challenges of climate change, ecosystem degradation, poverty, inequality rise and fragile governance. How to bridge the two implementation tracks is the question addressed by a new working paper released by WRI and the German agency for international cooperation, Deutsche Gesellschaft für Internationale Zusammenarbeit (GIZ), on behalf of the German Federal Ministry for Economic Cooperation and Development (BMZ). Drawing on examples and lessons learned from 11 countries and the European Union, this paper provides options for advancing the two agendas jointly. Our research shows that joint implementation requires linking up institutional, policy, financial, monitoring and reporting frameworks set up for the SDGs and climate action (see Figure 1) and can generate clear benefits such as reduced transaction costs, enhanced policy coherence, and cost efficiency. The good news is that a growing number of countries have started taking concrete steps to advance both agendas as one. In most countries, national coordination frameworks for SDGs and climate change are led by distinct institutions and engage stakeholders differently. 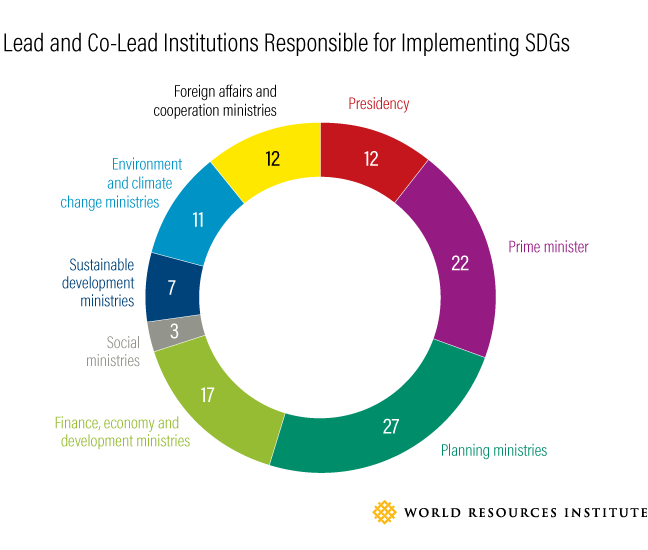 A WRI survey of 90 countries shows that on average, seven out of eight countries chose environment ministries to steer NDC implementation Figure 2, while they entrusted the 2030 Agenda to more central cabinet-level institutions, such as cabinet and president’s offices or planning and finance ministries (Figure 3). Note: The 90 countries include those studied, those having reported at the HLPF in 2016 and 2017, and members of the NDC Partnership. 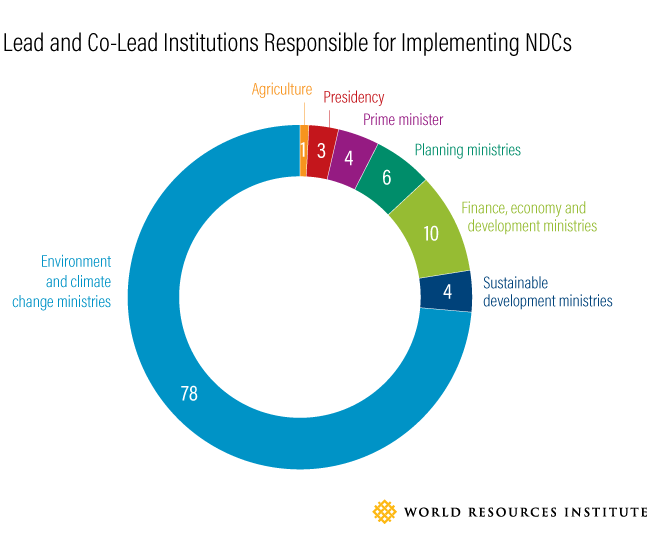 Some institutions have a co-lead role, hence the difference in total countries (90) and total lead institutions recorded (110 for SDGs and 106 for NDCs). Categories chosen reflect the most common differentiation between ministries. Finance and planning ministries have been counted as planning ministries. Through enhanced coordination, typical SDG and NDC lead institutions can build on their different strengths, authorities and expertise to engage the government and other stakeholders more effectively. Mexico is one of the few countries that actively aims to avoid duplications and separation of expertise and implementation. The president’s office, which is leading on the 2030 Agenda, and the Ministry of Environment and Natural Resources, which is coordinating NDC implementation, agreed in 2017 to ensure synergies between their strategies and consistent approaches to policy and budget alignment. Institutional divisions have resulted in limited alignment between countries’ climate actions and sustainable development targets underpinning the global SDGs. The climate policymakers we interviewed acknowledged their limited understanding of how the far-reaching and relatively unspecific SDGs could support climate policymaking. Likewise, sector ministries often regard NDCs as technical documents that are difficult to use for policy planning. Cross-fertilization is needed, not only to foster synergies between both agendas, but also to reconcile their different goals (e.g., ending extreme poverty and achieving carbon neutrality) in national-level implementation. A few countries have sought greater alignment. This year, Mexico released a study on the contribution of its NDC to the achievement of the SDGs. 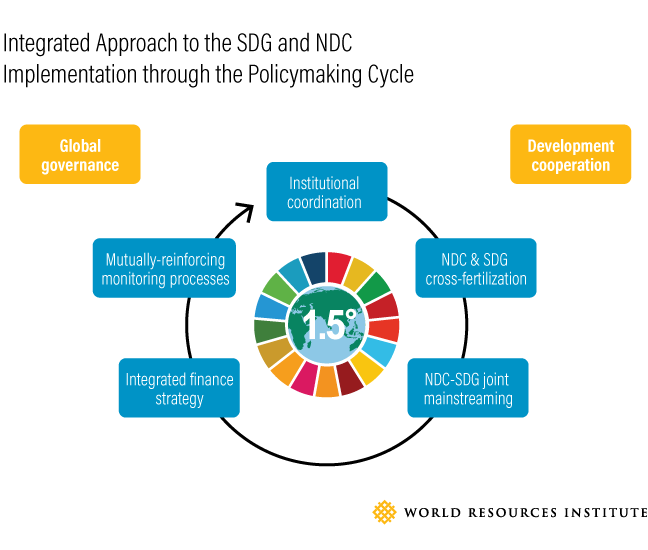 The country identified NDC actions having the greatest SDG benefits as priority “development accelerators.” With support from WRI, Kenya also undertook an SDG impact assessment of the actions it proposed for its National Climate Change Action Plan 2018–22. The analysis, conducted with both climate change and SDG focal points from sector ministries, helped identify key win-win priorities for climate action and the SDGs, such as promoting clean cooking stoves and rangeland rehabilitation. Both studies also call for specific measures to maximize the benefits of climate actions on inequality reduction and gender equality. These early experiences showed that focusing on SDGs’ benefits helps advance a compelling development case for NDC implementation and secure greater buy-in from ministries. Aligning countries’ long-term visions and strategies with the 2030 Agenda and the Paris Agreement is essential to guide policy making effectively and send clear signals to markets and the society. Ethiopia and Finland have adopted consistent long-term visions pursuing economic sustainable development, equity, climate resilience and carbon neutrality in an integrated way. As of 2018, Peru is also reconciling the SDGs, the goals of the Paris Agreement and national priorities for accessing the OECD in formulating its Vision for Peru by 2050. The formulation of long-term low greenhouse gas emissions development strategies called for by the Paris Agreement also provide an opportunity to develop one single overarching strategy to meet both agendas. Such an overall strategy could merge different long-term planning instruments, including national vision documents, which provide a framework for a series of medium-term national development plans, and long-term sustainable development strategies. Ensuring that SDGs and NDCs are embedded in policy planning and budgeting is challenging for all countries. The proliferation of different guidance for mainstreaming SDGs, NDCs and cross-cutting objectives such as gender equity and green growth makes planning and budgeting more complex. Experts we interviewed highlighted the need for simple, comprehensive sector-specific guidelines, as well as consistent use of performance frameworks and budget-tagging systems that take on board both SDG and NDC objectives. Colombia provides an example of consistent guidelines and support for building SDGs and NDCs into local development plans. Its planning tool for localizing SDG national priorities, Kit Territorial, requests that 100 percent of the departments and their capital cities adopt climate change plans and mainstream SDGs, including climate actions, into their development plans. Several countries have also started reviewing and enforcing SDG-NDC mainstreaming. This year, the Uganda National Planning Authority plans to revise its certification system that assesses compliance of sector planning and budgeting instrument with the national development plan to track alignment of policies and budget allocations with NDCs and SDGs. Obligations for sector ministries to report back to parliaments on SDG-NDC alignment of their policies and budgets have also been included in legislation, such as through the 2015 Finnish Climate Change Act. Governments increasingly realize that consistent, integrated national monitoring and reporting systems and data strategies for the SDGs and climate action would reduce costs and better inform policy planning. The Philippines, Finland and Kenya assessed the relevance of global SDG indicators in monitoring climate actions, especially adaptation. Their experiences show that most climate-relevant SDG indicators require modification to make them climate-smart. For instance, Kenya “climate-proofed” SDG indicators for its National Climate Change Action Plan (NCCAP). For instance, the NCCAP indicator measuring the “number of people permanently displaced from homes as a result of flood, drought or sea-level rise” focuses the SDG indicator 1.5.1. (Number of deaths, missing persons and persons affected by disaster per 100,000 people) on climate change impact. Several countries have also included reporting on SDGs and NDCs in annual growth reviews and budget processes. A 2015 French law supports SDGs and climate commitments by requiring the government to annually evaluate wealth indicators beyond GDP, such as subjective well-being, income inequality, poverty, early interrupted education, carbon footprint and land-use change. The law requires the government to submit to Parliament an annual report tracking progress on these indicators and assessing potential budget impacts of the proposed actions along with its budget bill. These national efforts to merge SDG and NDC implementation could be better supported by global reporting frameworks under the Paris Agreement, the UN High-Level Political Forum (HLPF) and international development. The upcoming HLPF 2018 and the Talanoa Dialogue, reviewing implementation of the SDGs and the state of climate action respectively, offer near-term opportunities for countries to engage in discussion and develop synergies to ramp up their national ambitions.